CoreCumin® is Nurish.Me’s flagship curcumin product that is superior in terms of absorption and effectiveness due to our proprietary formulation process and nanotechnology. * When you try CoreCumin®, you will feel the difference! Shipping will be calculated at checkout for US states and territories and foreign countries. CoreCumin® is a technologically-superior nano-curcumin version of standard curcumin products that have poor efficacy due to inadequate absorption and cellular utilization. Curcumin is a fat-soluble (insoluble) molecule that is rapidly metabolized by our body (liver and intestine), which normally severely limits its therapeutic use. In its extracted form, very little of a typical dose of curcumin gets absorbed by the human body. The rest either breaks down in the presence of enzymes in the liver and the intestine or gets rejected as waste. The difficulty in delivering curcumin restricts its use. Thus, for therapeutic purposes, curcumin had to be administered previously in high doses. However, these limitations are now a thing of the past with our micelle technology that enhances bioavailability and hence efficacy. We provide you a therapeutic, bioavailable curcumin that allows your body to better utilize its numerous benefits that are being studied and documented by many scientists all over the world. Combining CoreCumin® with CogniNurish® gives you broad overall support for keeping your health optimized. Menstrual cramps gone with CoreCumin and more...! I have been drinking CoreCumin for several months and have noticed the energy and a difference in my body. After taking CoreCumin for some time menstrual cramps and discomfort have disappeared almost in its entirety. Yes, it is a natural thing for the ladies, that I don't think any women loves your body on those days.... CoreCumin can help you! The whole menstrual period changes in your body, for the better. I have also noticed that I do not feel so groggy and tired in the morning when waking up. CoreCumin has definitely helped me, thank you for creating such great product!! I am a believer in CoreCumin!!!! I started using Core Cumin at the end of February, two times a day, at both breakfast and lunchtime. I am an athlete, but also have old injuries that flare up - a chronically sore lower back from being in a car crash over 20 years ago, sore ankles from multiple sprains from playing soccer, and I also get the usual aches and pains as someone who spends a lot of time sitting at a desk during the work week. I have found since starting CoreCumin that the soreness and aches that I had come to accept as a part of my life are gone, and also my energy is much better so after work and on the weekends I can get my workouts in, whereas in the past I would sometimes get home from work and feel I needed to nap instead of working out. Also, having lost close friends to cancer, and having an awareness of the associated link between cancer and inflammation, I am very conscious of trying to maintain low inflammation in my body, so incorporating anti-inflammatory foods into my daily routine is very important to me. I am a believer in CoreCumin and highly recommend it!! I had a personal review of CORECUMIN and the President of this company addressed me like his own family. He promised me a refund and encouraged me to continue taking the CORECUMIN bottle that I bought. He also put me in touch with Pamela from the company for compassionate care and response. I am grateful for this conversation and it is more reinforced to continue with this product-company. This made my wife’s shoulder feel so much better after only an hour of taking it. Also, our cat felt great after only a few drops. Please try this! It’s amazing. I just got diagnosed with Ulcerative colitis at the age of 29. My buddy recommended this product to me explaining the magic wonders of it. After 2 weeks, I can proudly finally say that my gut is finally at peace. I no longer have a gassy gut all day, my stool movements have actually gotten better and overall I just feel healthier. The best part about this product is the way it breaks down when you mix it in your water bottle. No clunkiness and the way his product breaks down in the water makes it just flow naturally with your body instead of having your body break it down. Seriously life changing stuff in a bottle and I can't wait to restock on this stuff. CoreCumin definitely helps those dealing with Chronic Depression. Highly recommend incorporating into the treatment regimen. Coming from someone dealing with Depression for over 20 years. I have being taking this product for about 2 weeks now. I feel great, energized and free of any pain. CoreCumin is a superior product! I have BPH. The symptoms are increased when I have any foods or liquids that are moderately spicy or contain caffeine. I have tried a number of different brands of curcumin with very limited impact. Within a week of taking CoreCumin, I noticed a significant reduction of symptoms. I highly recommend CoreCumin! This product helps to alleviate the Migraines that I get regularly. It also helps me feel better throughout the day. An amazing product. I highly recommend it! I have been taking the product for quite some time. As a runner I have noticed that my joints do not ache as much and I am really excited about the science behind this product! My Achilles tendon is much better now after using CoreCumin. I'm almost not feeling pain anymore. Also my recovery has been faster between training sessions after using it. I recommended CoreCumin to an old friend who was feeling pain for a long time on his knees. He told me that it was like a miracle when he took CoreCumin. He said: - "My pain had gone away!" There are many people and athletes in Brazil that would love to use CoreCumin to relieve their inflamaatory pain. Thank you John for introducing CoreCumin to us. CoreCumin has relieved all my pseudo gout pain. It is amazing how quickly it worked. I have been recommending CoreCumin to my patients with arthritis for some time due to its anti-inflammatory properties. The challenge with most current supplements is limited oral absorption, which makes it close to impossible to receive a strong enough dose to get real clinical benefits from over the counter formulations. The formulation of CoreCumin bypasses that problem. Great supplement! Feeling better after just a few days with CoreCumin! I was recently diagnosed with arthritis in my hands and the pain was really bad, waking me up during the night and getting in the way of basic activities such as typing and cooking. My physician prescribed Celebrex but after reading about the side effects I decided not to go down that path. Luckily for me I found CoreCumin and after taking it for just a few days my pain has significantly reduced. I can see now that I won't need to take medication because with CoreCumin pain no more! Thank you for taking to the market such an amazing natural product! CoreCumin has reduced my pain & improved my mood already! I am experiencing less inflammatory pain and enhanced mood/clarity already, in less than 2 weeks! ....and I like the taste. CoreCumin makes a noticeable difference in mental health and should be part of the standard of care in the primary care setting. God willing, it will go mainstream soon to ease the suffering of so many dealing with mental health issues. Healing my headaches and Type 1 diabetes! I started taking this product 3 months ago and it has helped me with a number of things: > I am an ex football player, I have suffered headaches for the last couple of years that I could not seem to heal. While taking this product I have not had these headaches that used to take hours from my day. > I am a Type 1 diabetic and before taking this product I was struggling regulating my blood sugar and keeping my blood sugar down. I was taking a lot of insulin and overall not feeling my best. Since taking this product I have cut my insulin intake in half and have regulated my blood sugar throughout the day. This has changed my life! 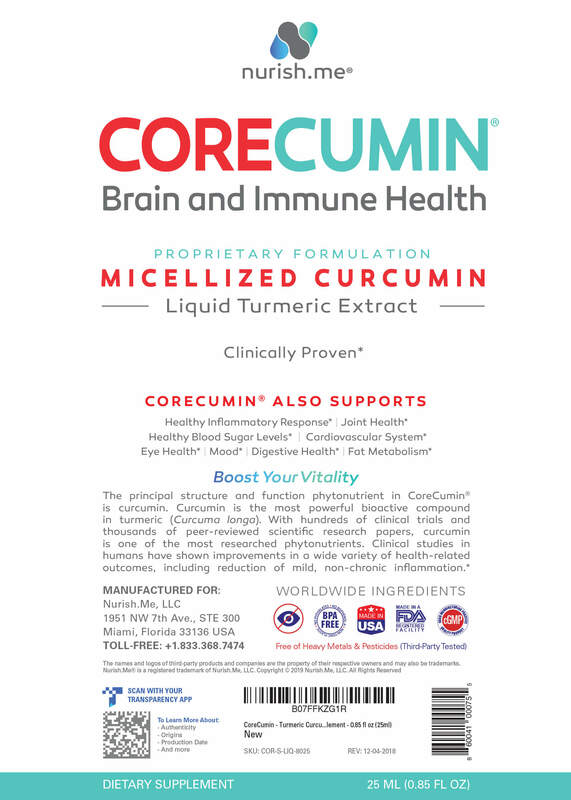 CoreCumin has been a wonderful and helpful addition to the daily intake and regiment of natural, health and wholistic care we have been giving to my father in law with Alzheimer's. The Nurish.me products have improved his mood, given him more day to day energy and generally is adding benefits in a natural organic way at a time when all anyone wants to give him are chemical drugs that don't work. I’m a 51-year old male in good health. I exercise regularly, and I’ve now been taking CoreCumin for a little over 3 months. I’ve noticed benefits in the following areas: (1) increased energy, (2) increased intensity of my workouts, (3) much faster recovery from my workouts, (4) a dramatic reduction in joint pain, and (5) improved sleep. In addition, my cholesterol level recently tested out at my lowest overall number ever. I strongly encourage others to give this product a try, as I’ve been very pleased with the results that I’ve experienced. I bought CoreCumin for my wife originally, mostly for her plaque psoriasis, but decided to use it myself as well. For her, it did reduce some of the inflammatory response, which is quite remarkable because psoriasis is an auto immune disorder and not in the usual wheelhouse of products like CoreCumin. It did help her, nevertheless. As for me, it reduces my joint and muscle soreness, part of getting older. In my dental profession, we often sit, lean or bend in uncomfortable positions for access and visibility, no matter how hard we try to sit up straight. That's where the soreness comes from and the CoreCumin helps reduce it. About the only drawback is the taste but we add it to our morning smoothie, so that's not an issue for us. CoreCumin improved my athletic performance. I'm a master hurdler/sprinter (48 yr old), researcher and professor in Exercise Physiology. When I begun the treatment with this amazing supplement, I was feeling tired all the time. I had no energy nor interest in things... I had too much inflammation and my recovery time from training was slowed! However, when I initiated the use of CoreCumin product you provided, I felt like another person within few days. My energy level increased again, and so my motivation. Then, after a few days I felt much better, and after 2 to 3 weeks I realized that I was being able to do some training workouts as intense as when I had 35 yr old (I'm 48 now). I felt that my recovery time shortened significantly due to lower inflammation, and as a result, I did great performances either in 110 m hurdles and 400 m hurdles within 30 days following the supplementation. By the first time I used this supplement I became placed in the 2nd position in the world ranking in my age group (M45-49yr) for the 110 m hurdles, and was 1st place in the World Master Athletics Championship in Perth - Australia! Also, whenever I'm using this supplement my performances in activities of daily living, such as those in academics, are more pleasant and productive! Thank you so much!! Now even my wife and our two kids are using the curcumin too, and all we are happy with the results! Dr. Lewis and I have known each other for many years. His knowledge of my health conditions and guidance in resolving the symptoms of rheumatoid arthritis holistically have been invaluable. When I was introduced to CoreCumin the results were tremendous. Not only did it relieve the inflammation I was experiencing in my hands and wrists but my mental health improved significantly as well. I have experienced depression on and off throughout my life. The pain experienced from the RA exasperated my depression. Within days of taking the Core Cumin, the dark cloud and weight was lifted. I knew about and expected the improvements in the inflammation but having the significant improvement mentally was an equally welcome benefit. The benefits as a holistic nutritional support product to my overall health have been amazing. Thank you Dr. Lewis. Any lifelong gout sufferer knows there is no placebo effect & for me, it's worse I have arthritis of the spine as well. Gout flare-ups can happen anytime and for me, it means I will have 3-4 days of serious discomfort. During a recent business trip, I had a flare-up at the worst time and being that I was already on daily maintenance dose I tried doubling it along with my regular program of increasing water intake and tart cherry and in 24 hours I was symptom-free. Thank you! As a physician, I'm always looking for the highest quality supplements. CoreCumin is the most potent curcumin supplement I've found. It's a powerful anti-inflammatory effective for a variety of conditions. I have also used this post-workout for recovery. Incredible! I have back and neck injuries due to a car accident more than 20 years ago that left me with chronic pain and inflammation. After I started taking the Corecumin drops, I quickly felt the pain relief and also noticed I didn't have any post work out soreness. I also applied the drops topically to a cut on one of my fingers that healed quickly and left no scar. I highly recommend this amazing product! This product is extremely effective in addressing multiple health challenges. The health benefits of curcumin has been amply demonstrated in numerous scientific studies. But curcumin is notoriously difficult for the body to absorb. The formulation of Corecumin enables a high level of absorption. Just what the doctor ordered! I have had an autoimmune disease for 7 years. I have been on high doses of steroids, anti-rejection medications, and monthly chemotherapy. I started using Corecumin daily about 4 months ago. I no longer require chemotherapy infusions, and my steroids and anti-rejection medication is a third of what I had been required to take. My doctors are in awe and agree with my using it. THANK YOU NURISH.ME!!!! I am a 78-year-old physician who had ALWAYS been skeptical about supplements. I researched CogiNurish and Corecumin and discovered that their preparation was readily absorbed and highly bio-available to my cells. I became a “test” subject taking Corecumin twice a day. After one month I was able to stop my blood pressure medications and discontinued prednisone that I had been taking for 4 years. I am no longer a skeptic, but a believer. In my opinion it is a good as any anti-inflammatory agent. My solution to anxiety and low energy! I have been taking the Corecumin for only 2 months at the recommended dose. It has helped me to have a more stable mood, along with being able to handle stressful situations with a very calm and clear attitude. I have also experienced increased energy levels in the morning which has allowed me to stop caffeine intake fully without side effects or feeling tired throughout the day. My flexibility throughout my yoga workouts has improved as well by relieving muscular and joint pain during and after my practice. It has also eliminated constipation which was a very big issue for me. 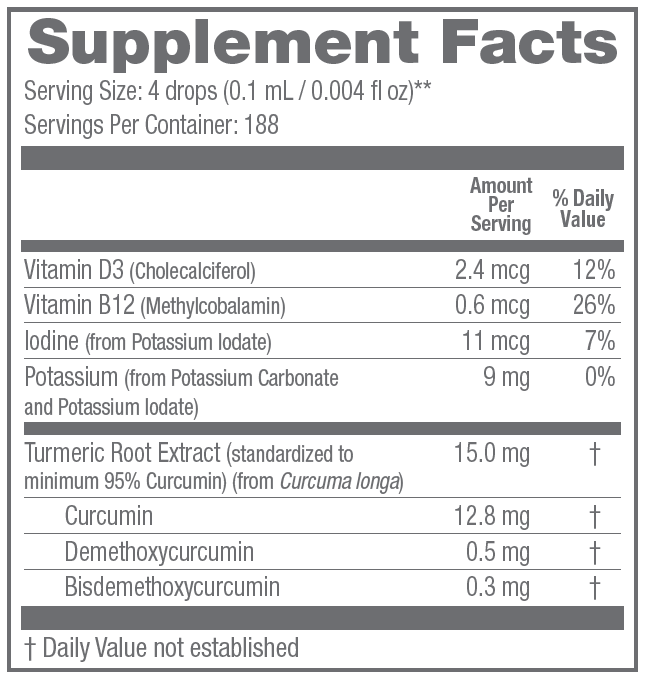 I am very pleased with the benefits of this particular form of curcumin. I had tried other formulations before, but this one is the best for me. I feel like my body absorbs it immediately. 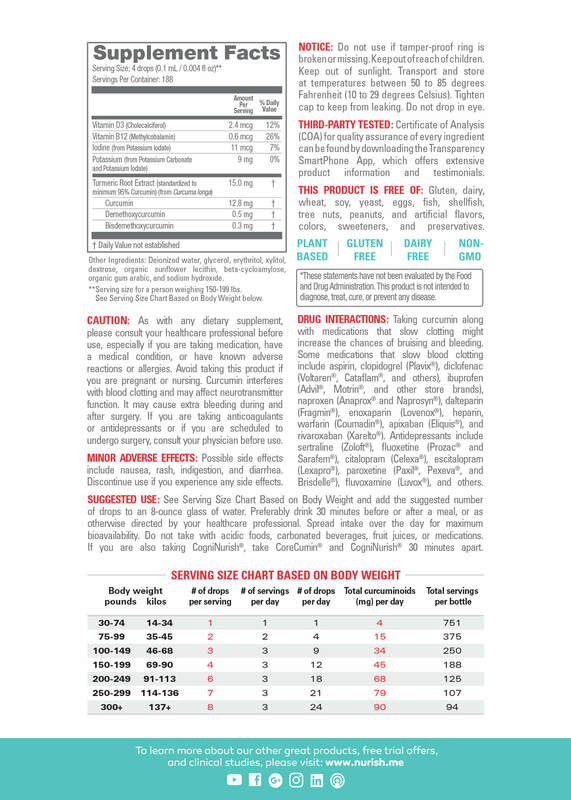 I continue to use this amazing supplement in a regular basis. I’ve had a house cleaning service for 18 years and this year discovered I have arthritis in my hands. With this being said I thought I’d have to retire early. But then I found Corecumin and after taking it was able to work virtually pain free. It’s been truly amazing. I was also in a car accident this year in my van was totaled. My shoulder was partially dislocated. Using corecumin helped with the inflammation in my shoulder so much that I only missed a couple of days of work . Absolutely love this product! CoreCumin is an amazing product that I would highly recommend to anyone looking to protect themselves against cancer, heart disease, hormonal imbalances and digestive issues to name a few. I was recommended to use this by my doctor to combat inflammation from gluten intolerance and find that it has not only helped my entire digestive system but I find myself sleeping better and dealing with stress better. It is super easy to take and has had no negative side effects for me. The best word for me that describes CoreCumin is energetic. I take in the mornings when I get to work and I feel energized. In my profession I walk about 6 miles a day on my feet for most of my 8 hour day and CoreCumin definitely helps me get through the day feeling great. Prior to taking CoreCumin I would usually peter out before the end of the work day but since I've been taking CoreCumin I'm still feeling energized after the work day is done and I also work out 3-4 days a week after work and I still feel ready to go. I highly recommend CoreCumin!!! I was always complaining about sore joints after I “fully” recovered from a sprained ankle. I was not able to run or even walk without noticing discomfort and weakness on that foot. I could not even wear heels without feeling scared to lose my balance and fall. John told me about CoreCumin and since I always have good results using turmeric I decided to give it a try. I am amazed how quickly I started to feel better and stopped thinking about my foot. Now I can run, walk and wear high heels like I did before the accident. A few drops a day not only gave me back my normal mobility, it helps me with my energy levels and my immune system. I am not afraid to be near to a sick person since I know my body is strong enough to fight any cold or flu. If you knew me, you would know that I am somewhat skeptical by nature; however, after taking the curcumin for about two weeks I noticed my ability to concentrate had improved. I was working through some music that I was trying to learn in my head, and, to my amazement, my ability to concentrate on the chords/notes was fantastic. It was really nice because I wasn’t near my guitar. I really do believe that it has increased my ability to concentrate and therefore my ability to learn. I’ve been hooked since that moment. I would really encourage anyone who either has trouble concentrating or anyone that has a need for clarity of thought to try this wonderful supplement for a month and see what it can do for you. I have experienced amazing results since I started taking this product six months ago. I have a much higher energy level than in a long time. In fact, my grandchildren, in the past four months have made many comments regarding my looks and energy level since I began taking it. Those are beautiful words to a 78 year old grandmother. Thank you CoreCumin and I highly recommend this product to everyone. I took this product for a tendinitis issue I was having with my knee due to overuse and cycling. Within a week my knee pain was completely gone and I was able to return to normal activity. I have used other curcumin products in the past and they were ineffective. I really believe that CoreCumins' unique structure helps with bioavailability and absorption. I highly recommend using this product as part of your daily routine. This product has helped me with minor inflammation/pain in my joints and lower back. I began taking it and after about a week my minor aches and joint pain had completely subsided. I highly recommend this product! When I was first told about CoreCumin, I was skeptical, but hopeful. I received the CoreCumin and had been taking it daily for 2 weeks. Then one day, after running, I noticed one of my ankles was injured. Having injured my ankle before, I knew it would be at least 1 week, maybe 2 weeks before I could expect to be able to run again. The following morning, it was as if my ankle had never been injured. I had never had an experience like this before. About 1 week after this after running, I noticed I had pulled something in one of my knees, again, the normal recovery period was at least 1 week, but again, the following day, it was like new again. These two experiences happening back to back along with a significant decrease in muscle soreness, I knew this was working. I was told to expect this, but, after it happened I knew there was something to the CoreCumin. Finally, I give this 5 stars, because it exceeded my greatest expectations. I've starting telling my friends about it now. I am very pleased with the performance of the CoreCumin product. I have recommended this product to several friends and associates. I have found that it is extremely effective and have received enthusiastic comments from everyone that I have recommended this product. CoreCumin effect after my gym workouts. I have been taking CoreCumin for close to a month and I noticed that after my workouts, the recovery period is very short. The muscle pain associated after my workouts is almost nonexistent. I highly recommend this product. Pain in knees is gone! I started taking CoreCumin drops when I received them this afternoon. After 2 doses of 4 drops each taken 6 hours apart, I am amazingly pain free in my arthritic knees. I was told by my physician to discontinue taking Celebrex and Motrin because of negative liver lab results during routine followup blood tests. I have since been at a loss for a solution to my knee pain. CoreCumin seems to be giving my active life back to me. Thank you! Never using Advil or Tylenol again! This stuff is insane...After taking just a few drops I felt the effects nearly instantly. In about 15 minutes, my low back pain completely dissolved. I tried it again for a migraine I had and it alleviated it even quicker than Tylenol does. I'm hooked, thanks for changing the game! I took this product after a major surgery and all my pain subsided in less than one hour and my inflammation from surgery healed in record time according to my surgeon. Thank you! Your review has been received! Oops! Something went wrong while submitting the review. Please check all fields are filled correctly.